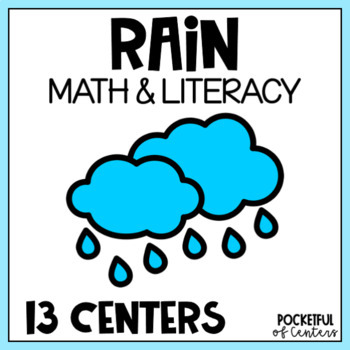 This BUNDLE of Rain Math and Literacy Centers for Pre-K and Kindergarten is perfect for hands on centers in April and May! Your students will learn beginning sounds, letter recognition, rhyming, sight words, cvc words, counting, number recognition, number order, and more! This money saving BUNDLE contains 5 literacy work stations and 5 math work stations for a total of 10 work stations in all! PLUS a freebie that is only included in this bundle: Five Little Raindrops Pocket Chart! Rain Beginning Sounds: Learn letters and beginning sounds with this Rain / Weather / Spring themed Letter and Beginning Sounds Match game! This fun activity is perfect for small groups and literacy centers. Simply spread the letter mats and cards out on the floor or table. Choose a picture card (raindrops) and place it on the matching beginning sound. Rain Rhyming Puzzles: This Rain / Weather rhyming activity is fun for literacy centers, morning bins, and small group lessons. There are 28 raindrop shaped rhyming puzzles for little learners to match. An "I Can" poster is included to use in a center. One enrichment sheet is also included. 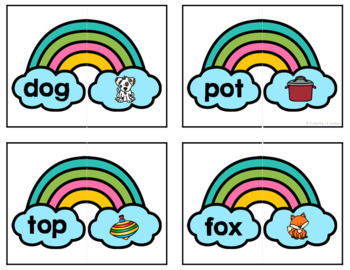 Rain CVC Words: These CVC puzzles make a great Springtime literacy center for April and May! There are 40 cards (8 for each short vowel). The children will place the two rainbow halves together to complete the puzzle. Use one short vowel set at at time OR mix and match with a few from each set. An optional enrichment sheet is included. 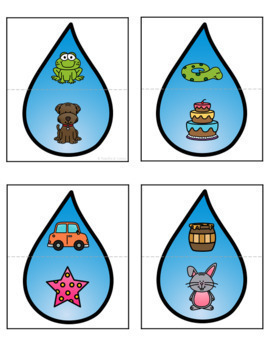 Rain Digraphs Game: use this Spring digraph game for small groups! This fun activity includes the digraphs CH, SH, TH, and WH. Rain Sight Words Spelling Mats: Use this engaging sight word activity in your small groups or word work center this Spring. Students will choose a sight word mat and spell the word using raindrop letter tiles. You can also use plastic letter tiles, magnet letters, playdough stamps or dry eraser markers (on laminated mats). Rain Race to 30 Game: This Rain / Spring themed math game is a fun game to play with a partner in kindergarten! Each player uses their own game board. They will roll a die and cover up the numbers on the board. They start with the number one and cover the numbers until they reach 30. This is a fun game that your kiddos will ask to play again and again. Rain Counting Clip Cards from 1-20: This Spring-themed counting game makes a great work station! The children count the raindrops and clip a clothespin (or seasonal object) to the numeral that shows how many. The game includes cards for 1-20 but can be modified to fit the needs of your students. An "I Can" poster is included to encourage reading independence. Rain Counting Mats from 1-20: This set includes a Rain or Weather themed counting mats for the numbers 0-20 and a sheet of raindrop counters. Each mat includes the numeral and number word. When they are placed in order you will notice an AB pattern in the background! The children will use the raindrop counters (included - or use shades of blue or clear gems or light blue pom poms) to count out the correct amount of raindrops to place on each mat. 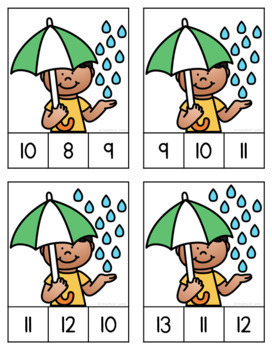 Rain Number Order from 1-30: There are three sets of number order cards included. One set is 1-15, one set is 1-20 and one set is 1-30. There are 8 cards in each set. The children will pick a card. Place the numbers in correct counting order and fill in the recording sheet. Answer keys are also provided. Rain Color Roll Game: Roll in the spring and weather fun with this Rainy Day counting and color identification center! To play this game students will roll a die (included) and color the correct amount of raindrops. Next, they will count them up and write their answers on the recording sheet.This BUNDLE of Spring Math and Literacy Centers for Pre-K and Kindergarten is perfect for hands on centers in April and May! Your students will learn beginning sounds, letter recognition, rhyming, sight words, cvc words, counting, number recognition, missing numbers, addition and more! This money saving BUNDLE contains 5 literacy work stations and 5 math work stations for a total of 10 work stations in all! PLUS a freebie: Five Little Kites Pocket Chart! Five Little Raindrops Pocket Chart Set (this is ONLY included in the bundle and is not sold individually) This is a great set to use during circle time and in your pocket chart center. This packet includes a "Five Little Raindrops" poem page, raindrop pictures to use as props for the poem, and the words ready to print and place in your pocket chart.